For starters, Google Glass has a 640 x 360 resolution display, which might not sound like much but remember it’s sitting very close to your eye. Google says it is the equivalent of a 25 inch high definition screen from eight feet away. The camera is capable of shooting 5 megapixel images and 720p videos. The sound will be transferred to your ears through bone conduction. Inside, the Google Glass will have 16GB of flash storage, out of which 12GB will be usable, Wi-Fi 802.11b/g (no n) and Bluetooth. The internal battery capacity remains unknown but Google says it will last for a day with typical use, although features like Hangouts and video recording will burn through the battery faster. Google also recommends you use the provided USB charger, although Google Glass can charge through any microUSB charger. 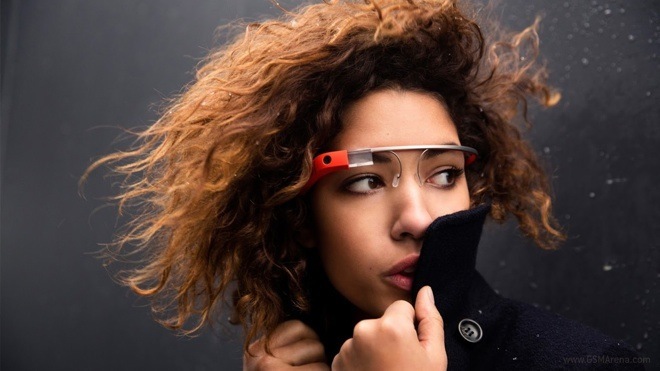 Google Glass is designed to work with any Bluetooth capable phone, but if to take full advantage of the Glass you’ll have to use the MyGlass companion app, which only works on phones running Android 4.0.3 and higher. The app enables GPS and SMS functionality.